Join this 2 to 2.5 hour small group tour of the National Museum of American History to learn about the relatively short but immensely rich history of the United States of America. Our passionate guides will take a small group of up to 8 guests to some of the most captivating pieces on display at this one-of-a-kind gallery. Meet for this 2.5 hour, small-group tour at the National Museum of American History a little before your departure time. There are two departure times offered for this tour. From a ragtag group of colonists to one of the world’s super powers, the United States has made quite a name for itself. 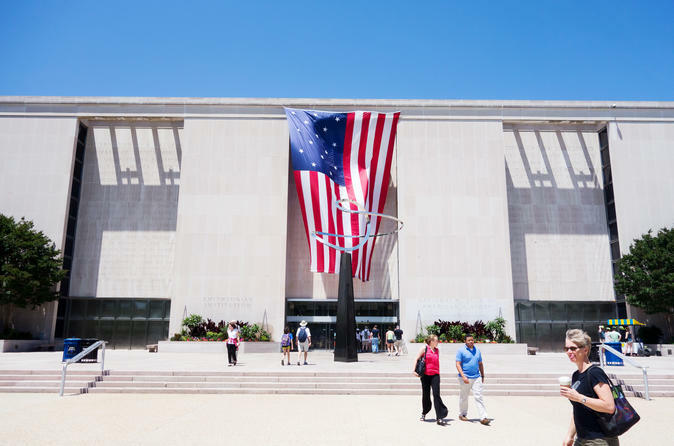 The National Museum of American History traces this path through a unique collection of objects including the actual banner that inspired the country’s national anthem. Learn about the first president, George Washington, while viewing his sword, and discover how Hollywood has helped shape this country when you check out Dorothy’s ruby red slippers. Plus, visit the extensive collection of first ladies’ gowns to the Greensboro lunch counter that embodies the Civil Rights Movement. This tour will help you to understand the exciting and oftentimes controversial history behind this vast country. After 2.5-hours your guided tour of the museum ends.